The more one mines the history of the Dulwich Hamlet Football Club the richer that history seems to become. We have spoken about the Buck brothers on several occasions. Most notably in Roger Deason’s scholarly article about Tom Rose in issue number 15 of the Hamlet Historian. There were seven brothers in all – from George to Septimus – and four of them were in the Dulwich Hamlet first team. The Bucks, as their name might suggest, were swaggering dandies, no less, who hailed from East Dulwich, and played an important part in the growth of the club during the first decade of the twentieth century. In an earlier day they turned out for local rivals Townley Park FC. Indeed, Joseph Buck was one of the founder members of the club. Sadly, due to an internal rift, they eventually left under a cloud, but not before a very successful period. 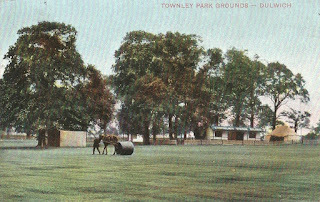 In 1903 and 1904 Townley Park won the Surrey Senior Cup two years in succession. The Hamlet achieved the same feat in 1905 and 1906. The latter of which saw the Bucks feature in the Hamlet side. Fred, Harold and Sidney Buck (pictured on cover of HH27) joined Dulwich Hamlet at the start of the 1905/06 campaign, and this band of brothers was a mainstay of the side for the next three years. The calendar people had already arranged that the two teams meet in a friendly at Burbage Road in mid-September. However, just weeks after switching allegiance, none of the Buck brothers were selected for the match. It was probably their choice. The relationship between the two leading clubs in the area was actually very good. Every Boxing Day they met for the annual charity fundraiser, where over the course of seven years hundreds of pounds were raised. In their second season at Champion Hill, the free-scoring Bucks were responsible for over forty first team goals between them, including two hat tricks for 21 year old Sidney. 1907/08 saw the introduction of Seppy Buck, the baby of the family, into the Hamlet forward line – which now numbered four Bucks – and a collective thirty odd goals. The next thing we hear, at the beginning of October 1908, is that three of the Buck brothers were assisting the Sidcup club New Crusaders. Pa Wilson breathed a sigh of relief. And how right they were! Sidney Buck found a suitable position amongst the forwards of the Montevideo Wanderers FC in Uruguay. 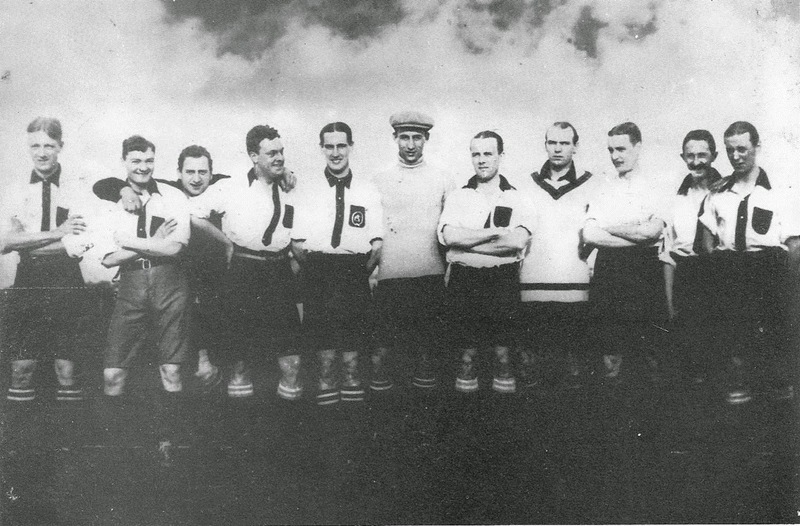 He can be seen in the 1909 team photograph (back row second player from left). The Wanderers apparently took their name from England’s very own Wolverhampton club. Incidentally, around the same time another Hamlet man, Billy ‘Colsey’ Millward, took up a post in the region and turned out for Belgrano Athletic. Montevideo, the capital of Uruguay is about a hundred miles downstream of the Argentinian capital Buenos Aires. The River Plate separates the two countries. The Uruguay – Argentina fixture was really the only international match these two national teams played at the time. Brazil did not yet have a team, and so the two neighbours were content to meet two or three times per year for one trophy or another. Between 1902 and 1915 they contested 34 matches. One coveted prize was the Copa Newton. The Newton Cup only dated back to 1906 but ran almost continuously until 1930, and then only sporadically until 1976 when the competition was scrapped. 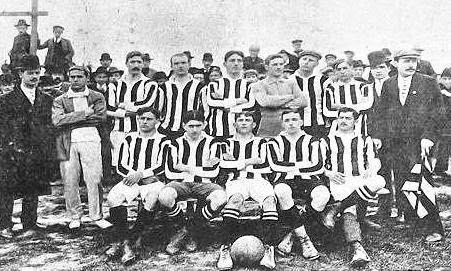 The 1909 match took place in Montevideo and resulted in a 2-2 draw. As was the custom in the event of a draw, the visiting team held the trophy for the year. Remarkably, featuring on the right wing in the Uruguay side was none other than the former Dulwich Hamlet man Sidney Buck! So, within nine months of arriving in South America he had managed to get himself included in the most important international match on the entire continent. It also makes Sid Buck one of the earliest former Hamlet players to win international honours. In May 1910 Chile was invited to send a team to Argentina to make up a triangular tournament. This was to commemorate the centenary of the May Revolution. It was the first time the two teams had ever met. In fact it was Chile’s first ever international. The tournament was almost a precursor to the Copa America and surely laid the foundation to the competition that we still have today. Again Sidney Buck was chosen for Uruguay’s two games, and scored the third goal in the three nil win over Chile. His third and final international appearance for Uruguay was in the decider, a 4-1 defeat by Argentina. It is difficult to keep tabs on Sidney Buck’s movements. He was certainly back in Inglaterra in the Townley Park side in April 1911 as his name appears on a team sheet. He then returned to South America later in the year and was soon found captaining the Quilmes Atlético * side in Buenos Aires. This was the season they won their first ever domestic championship – Argentina’s Primera Division – pipping Racing Club, Estudiantes, Belgrano and River Plate, all still at the top a century later. The very first encounter between Quilmes and Racing Club saw Buck among the goals, and in their first ever victory over their rivals in July 1912 he bagged a hat trick. He finished the season as the club’s leading marksman. The Argentine newspaper, Modern Times, wrote in glowing terms of Buck’s talent. “Sidney Buck needs no introduction. The majority of fans will remember him from the Uruguayan international team which was always most feared. Buck, on the football field, is the prototype of the English amateur.” The paper continued its praise holding him up as a role model for budding footballers. “It is worth studying his style: his dribbling skills and the control he has over the ball.” Once again Buck’s familiar face can be seen in the Quilmes team photograph …wearing a cricket jumper. Nicknamed ‘the Brewers’ and with strong British links, Quilmes was originally formed by players of the legendary Alumni Athletic Club. The Alumni were on a par with our very own Corinthians and on occasions supplied the bulk of the Argentine team. Quilmes continued that tradition. And in their ranks was R. Lionel Peel-Yates, whose description: “Vigorous, of medium height and sporting an enormous moustache.” warms one to him. Not only did Peel-Yates make four appearances for Argentina the previous year, but he was an Alumnus, a Quilmesman, and an old team mate of Sid Buck’s from their Townley Park days in Dulwich a decade earlier. Having been so successful for Quilmes, in August 1912 Buck was chosen to wear the blue and white stripes of Argentina against Uruguay for the Copa Premier Honor, another of those trophies contested by the two sides. It put Sidney Robert Buck among that elite group of athletes who had the honour of representing two separate countries at the same sport. Uruguay won the match 3-0. Within twenty years Uruguay triumphed in two Olympic football tournaments (1924 Paris, 1928 Amsterdam). In the latter they defeated their old rivals, silver medalists Argentina. And then two years later as host nation of the very first World Cup, they did exactly the same thing on their home turf in front of a crowd of 93,000. I wonder if any of the players on the Estadio Centenario pitch that day had studied Sidney Buck’s style as young boys. If they had …it was well worth it.